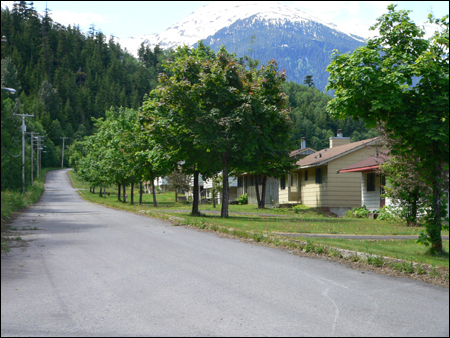 662 km west of Prince George, BC sits the ghost town of Kitsault. The town was established in 1979 as the home community to a molybdenum mine run by the Phelps Dodge corporation of the United States. Kitsault was designed for 1,200 residents and included a shopping mall, restaurant, swimming pool and bowling alley. In 1982 the price of molybdenum crashed and the entire community was evacuated after just 18 months of residence. Molybdenum is a chemical element. The name is from Neo-Latin molybdaenum, from Ancient Greek molybdos, meaning lead, since its ores were confused with lead ores. In 2004, the ghost town was bought by Indian-American businessman Krishnan Suthanthiran for $5.7 million, and has spent $2 million maintaining the town. There is an ongoing effort to revitalize the ghost town. Kitsault has been proposed as a location for a liquefied natural gas (LNG) terminal site for the export of natural gas from northwestern British Columbia.